Club moss is a low perennial plant; a moss-like evergreen, 3-15 inches high with creeping runners; the creeping, slender stem roots all along its length and sends up branches bearing tiny, stiff, linear, green leaves tipped with a white, soft, hairlike bristle. The yellow spores, with 1-6 strobiles, are borne on 1 or 2 club-like spikes growing on a long footstalk from the end of a branch. Found in dry, coniferous forests and acid soils all over the world. In North America; Canada south to New York, North Carolina mountains; west to Wisconsin, Washington. A related Chinese species in the clubmoss family is being researched as a potential treatment for Alzheimer’s disease. 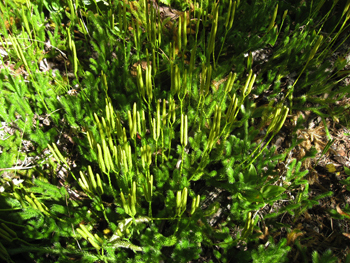 Native Americans, as well as Europeans, have used club moss spores as a powder to stop nosebleed, post-partum pains, fever, diarrhea, dysentery, gastric sedative, aphrodisiac, styptic, rheumatism, diaper rash, tangled or matted hair with vermin, herpes, eczema, dermatitis in folds of skin, erysipelas, and bleeding from wounds. The powder has been used to absorb fluids from damaged tissues in various injuries. At one time, it coated pills to prevent the pills from sticking together when packed. Native Americans also used to sprinkle the powder made from this herb on wounds to stop bleeding. Powder or extract of this herb is sold in health food stores and herb shops. The plant itself is poisonous, but the spores are not poisonous. 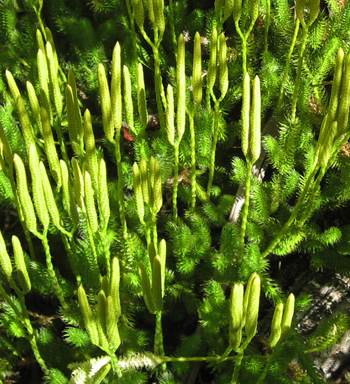 This clubmoss (L. clavatum) contains a toxic alkaloid.